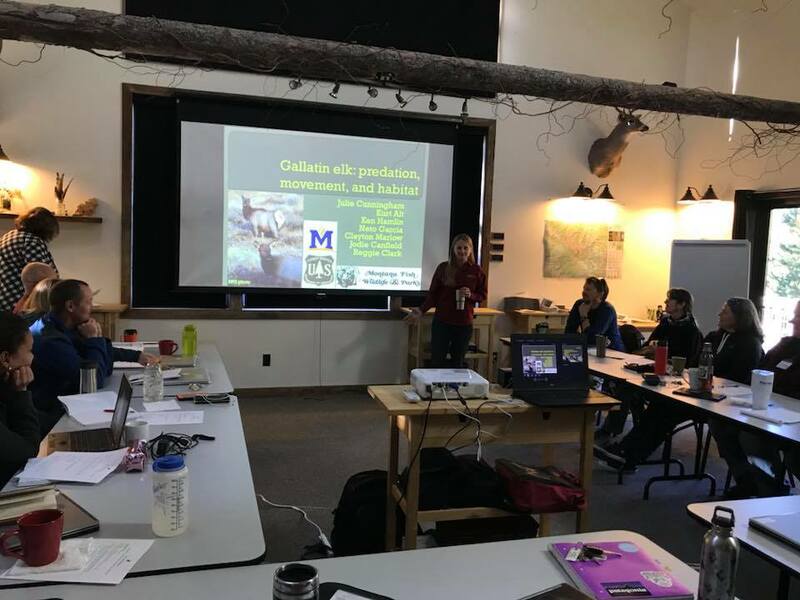 Jack Creek Preserve Foundation’s conservation Field school provides educators with professional development in wildlife and habitat conservation and management. Educators receive current knowledge and activities they can take back to the classroom. We are excited to have kicked off our first Conservation Field School for educators, on October 18 and 19. 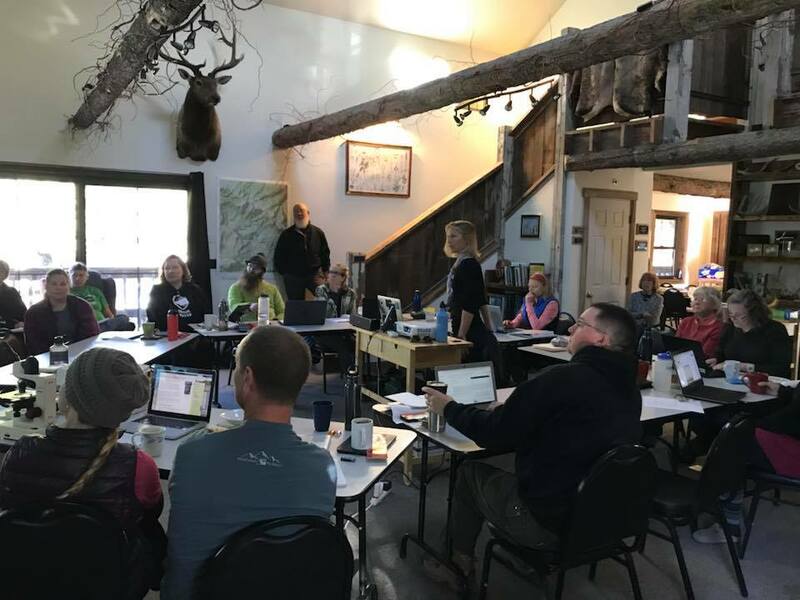 Our goal is to offer educators the knowledge, experience, and data that they need to provide real and local examples of conservation and wildlife management in their curricula. 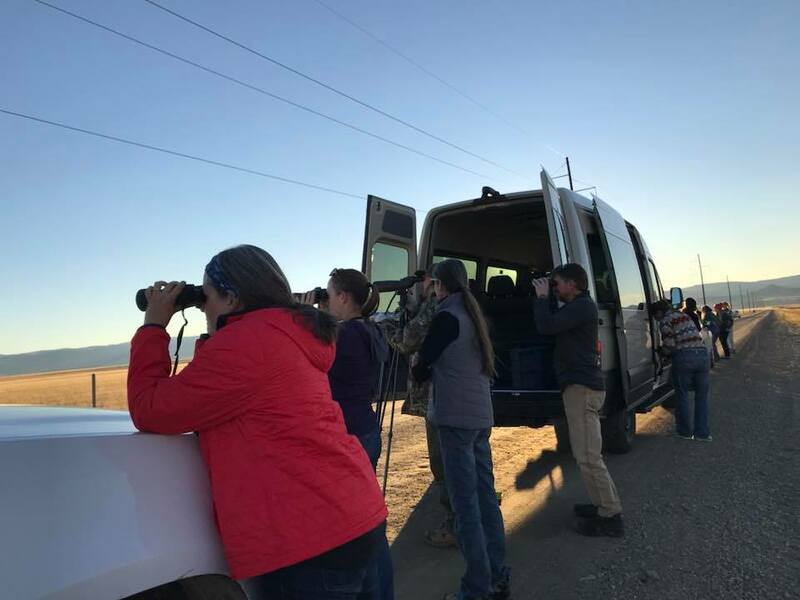 On October 18, 2018 we welcomed 17 participants to the Preserve’s Education Center from as far as Circle, MT and as close as Ennis. The Field School’s Program Instructor and Bozeman High School teacher, Robin Hompesch, facilitated the program. Robin got things started by welcoming Julie Cunningham, Wildlife Biologist from Region 3 MT Fish Wildlife and Parks. It was a day filled with elk ecology presentations, questions, discussions, and a field trip to collect data from a nearby herd of elk. The unique adaptations that have co-evolved in elk, mountain lions, and wolves. The history of these three species and how they illustrate different components of the North American Model of Wildlife Conservation. The different ecological niches occupied by wolves and mountain lions preying on the same species. Disease in Montana's ungulate populations and the potential impact on ranchers and hunters in the Greater Yellowstone Ecosystem. And the complexity of managing large prey and predator populations on a multi-ownership landscape such as the Madison Valley. 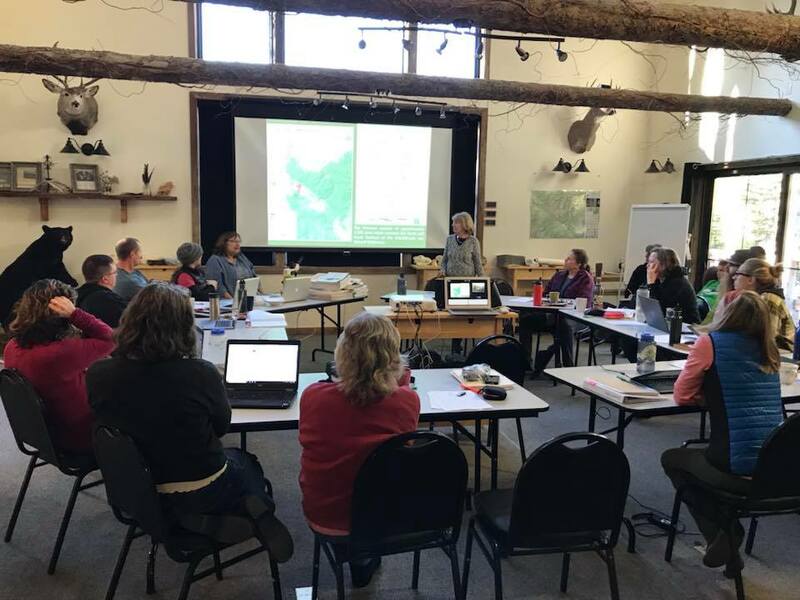 On Friday, we included talks from one of the Preserve’s founders, Dottie Fossel, and Jessie Wiese from MT Land Reliance gave us the ins and outs of conservation easements. By 3 PM on Friday, participants were headed home after enjoying our beautiful setting and earning 19 Office of Public Instruction renewal units. We will continue to work with these participants post-Field School to ensure they have what they need to incorporate this information into their lessons. We asked for participants to pay a fee of $30 to secure their registration, but thanks to generous supporters of the Preserve we were able to offer $250 scholarships for each participant. Most of the participants would not have been able to attend without a scholarship. If you wish to sponsor an educator for our future Field Schools, you may do so here. We anticipate that this is the beginning of another successful ongoing program for the Preserve. We will hold additional Field Schools annually and the next one will be July 2019, visit the 5 Day Conservation Field School webpage for more information. Registration will open in February 2019 for the July Field School. Let us know if you'd like to be added to our Field School educator email list and check back for updates.